Published: Nov 26, 2014 to ? The story begins with Yggdrasil, a popular online game which is quietly shut down one day. However, the protagonist Momonga decides to not log out. Momonga is then transformed into the image of a skeleton as "the most powerful wizard." The world continues to change, with non-player characters (NPCs) beginning to feel emotion. Having no parents, friends, or place in society, this ordinary young man Momonga then strives to take over the new world the game has become. 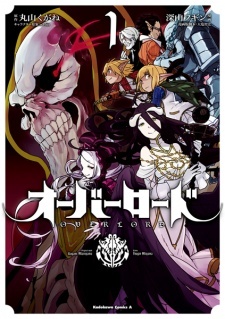 Overlord has been published in English by Yen Press since June 28, 2016 and in Spanish by ECC Ediciones since November 2017. Where to start with this little beauty of a gem without revealing any spoilers. So our hero gets trapped in an mmorpg as his player character, yet his player character is some skeleton lich character and he belonged to a guild of people who are no longer in the world he get's trapped in, yet he has access to the servants and artifcats they've gathered and crafted. The main character is entertaingly over powered compared to mostly everyone he meets, and shows a interesting level of cunning and deception that the goddess Lloth herself would be pleased with as he tries to find out more about his new world. There is also exploration into how his mind is slowly changing from human form to undead form, and I am looking forwards to how this may change with the whole 'keeping hold of his humanity' aspect. The humour is interesting, mainly of all the girls fawning over their undead lord (like, seriously, how on earth is he meant to bone them, pun intended), though their reasons for loving him seem rather flimsy currently aside from 'they were programmed to do that before and it's just carried over', though I am looking forwards to seeing him earn their trust a bit more. I see massive amounts of potential here for a truly unique take on this genre. Overlord has a massive cast of characters good and evil...and sometimes both! Meet the heroes and villains of this virtual world turned real.